This bread has a very rich history which takes it back to Ottoman rule of Turkey, all the way to 1500s. It is known by multiple names in the area; Gevrek (Ankara dialect), Bokegh (Armenian), Citir Simit (Istanbul variety), Pismithi (Ancient Greek), Ka’ak (Arabic), Sameet (Arabic) to name a few. 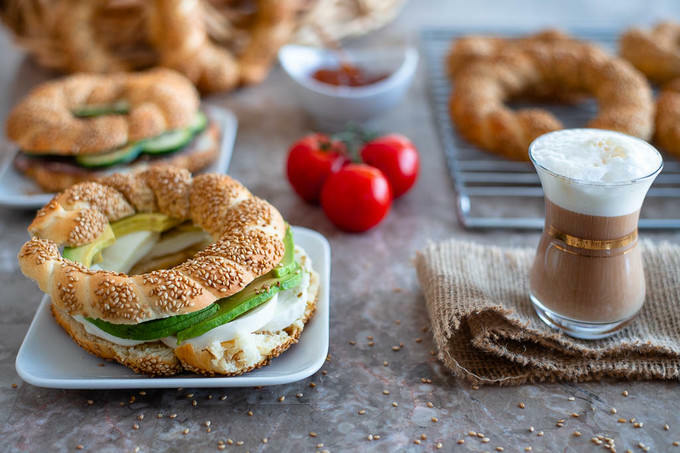 Simit can be enjoyed with virtually anything. I bake it in the mornings when I don’t have any bread in the house and I want to enjoy some freshly baked bread with double cream and marmalade. You can whip it up within an hour and this is a very hassle free recipe. 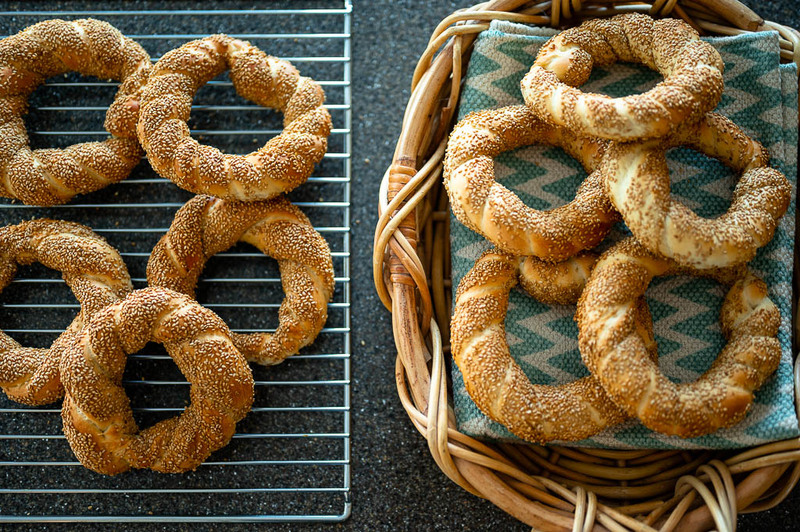 Traditionally simit can be a little chewy and maybe even harder. I like to proof my dough slightly bit longer so that I get some fluff into my simit. For this reason, I like to use less flour. Rested dough, along with the amount of oil that goes into it, should not require more flour. The dough will be quite pliable. Traditionally molasses is used in simit recipe. 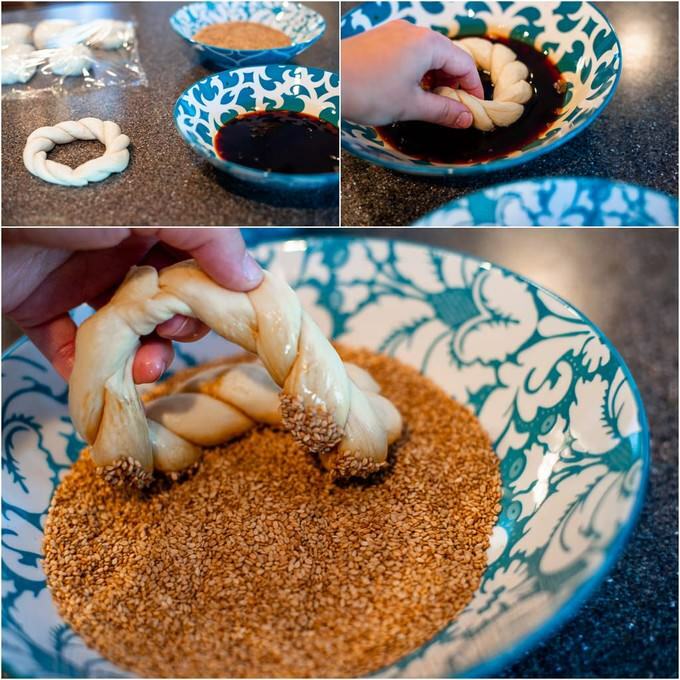 I also use grape molasses to dip the braided dough in. Molasses helps give that perfectly golden brown color to simit. If you do not have grape molasses, you can substitute it with other types of molasses. 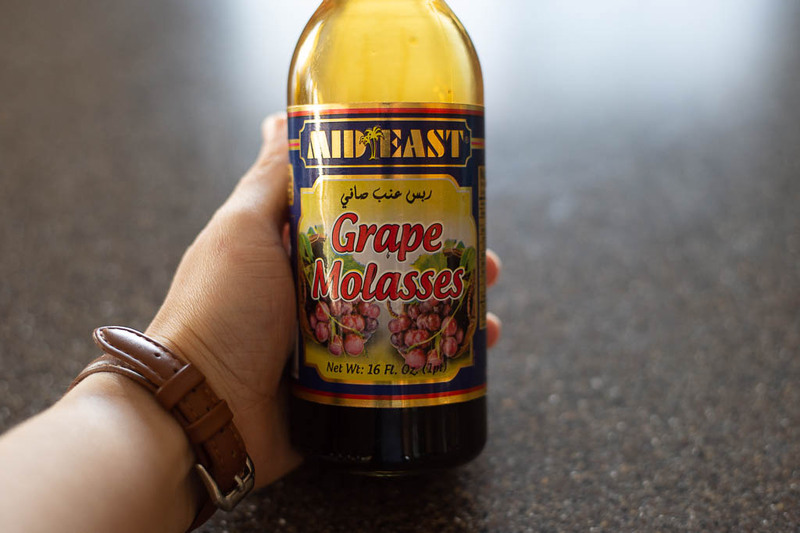 If you are using sour molasses (grape is quite sweet, pomegranate is quite sour) make sure to add a little sugar to it and dilute just a small amount with 1/2 cup of water. If you don’t have any molasses, water itself will be enough. In a medium bowl place warm heavy whipping cream and warm water. Make sure they are not overly hot. Hot water will kill the yeast. Our aim is to activate the yeast at this stage. Add the sugar, the yeast and give it a mix with a fork. 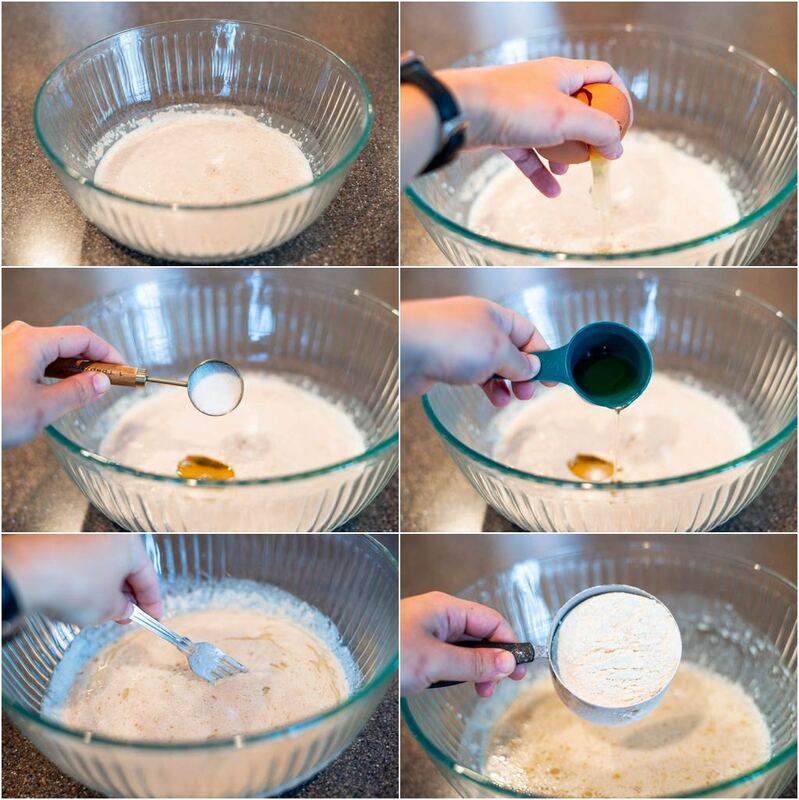 Cover the bowl with either a plastic wrap or the lid and let the yeast activate for about 5 minutes. Once you see yeast mixture frothing a little, it is time to mix the rest of the ingredients. Add 1 egg, 3 TBSP oil, 2 Tsp of salt and mix everything. Slowly start adding the flour and stop at 4 cups. 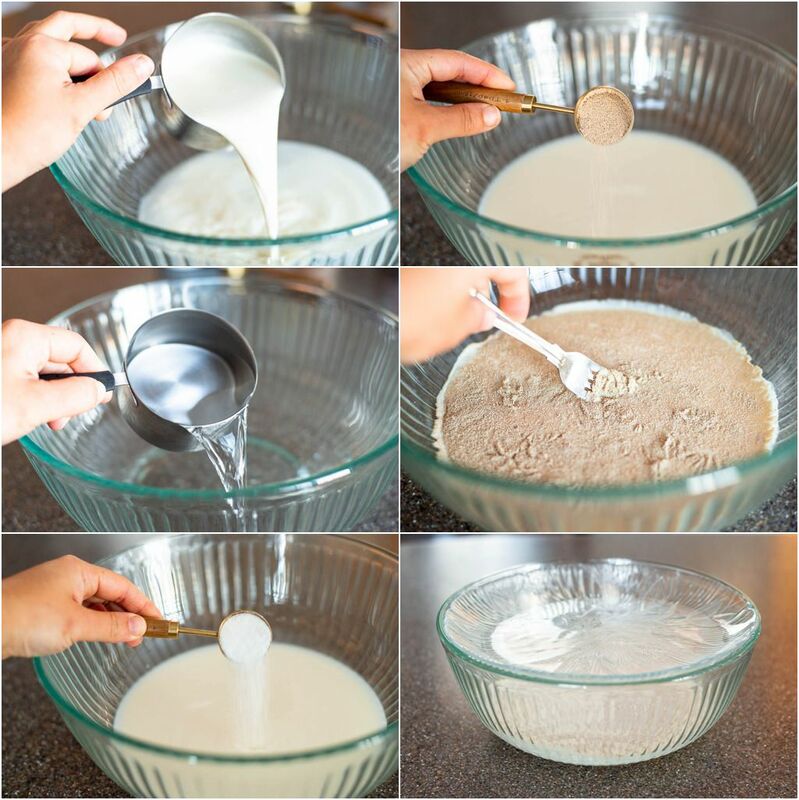 Start incorporating the flour into the wet mixture and slowly create a dough out of everything. If you feel like you need a little more flour to have a dough that doesn’t stick to your hands and is quite soft, add slightly bit more flour. I’ve made this recipe many times and usually 4 cups of precisely measured flour are actually enough. As you keep kneading the dough it will start keeping together better and become very pliable. 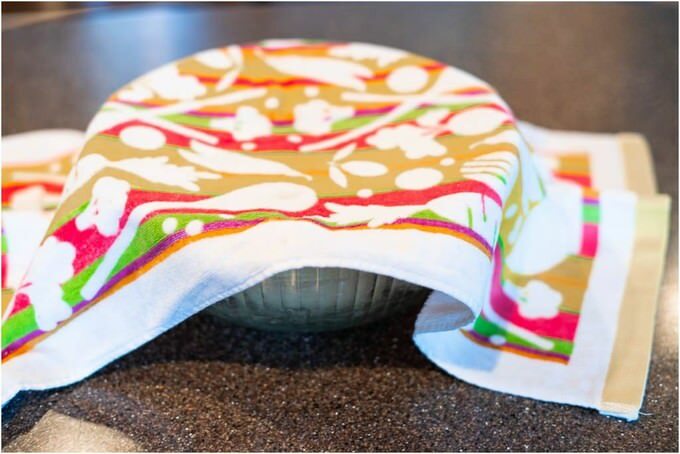 Cover the bowl with a plastic wrap and wrap it with an additional towel. Leave the dough on the counter for 30 minutes. With the amount of yeast you’ve made this dough, it will double the amount in no time. Uncover the bowl once 30 minutes have passed and empty it on the counter where you are going to be working with the dough. As I mentioned earlier, I do not use a lot of flour during this recipe. You can most certainly flour the surface from under the dough. But remember, the more flour you use, the more flour the dough will take in, rendering simit a little harder. For the amount of oil you have in the dough, you do not need more flour than you’ve already added into it initially. Cut the dough into 10 equal (more or less) parts. You will have 10 simit bagels. 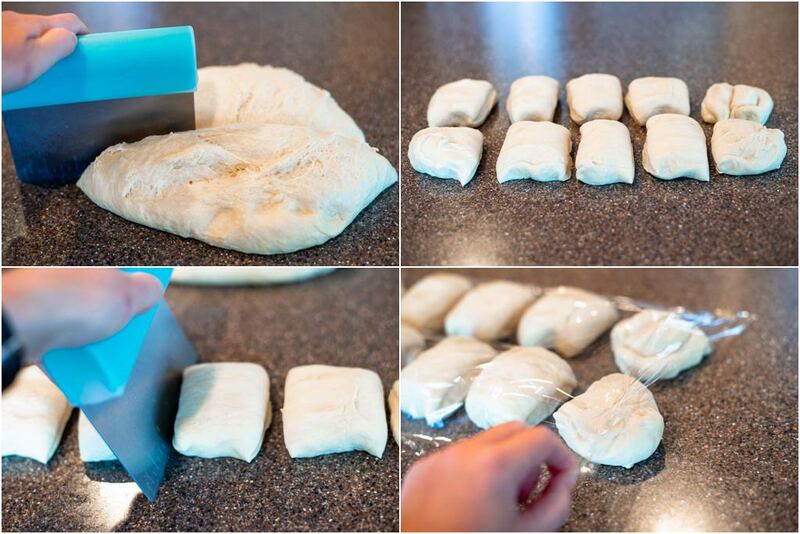 Cover the dough pieces with plastic wrap and let them rest for 5 minutes. 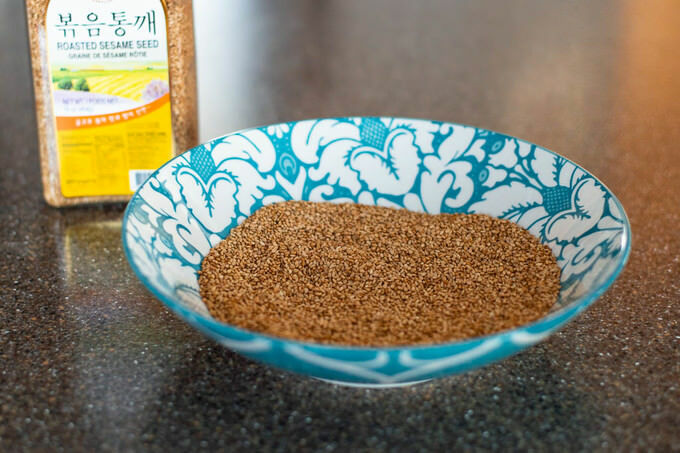 Meanwhile, place sesame seeds in a wide bowl and mix molasses with water in another. 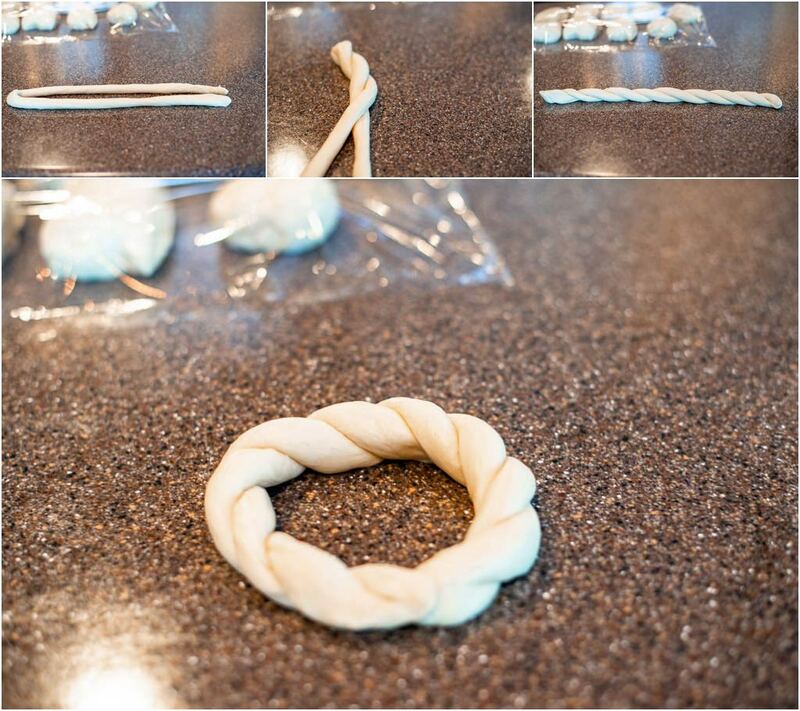 Also, keep 2 baking sheets ready to place braided simit. Start working with one dough at a time. gently roll out each dough, in one line for about 36-40 inches long. Don’t roll the dough out too quickly, as it may rip. Ripping is not a problem per se, you can stick it back together. However, your frustration might be :) At this point, you have a dough rope. Bend the dough rope into two and twist one side over the other, creating a 12-inch braid. Use a little bit of water to connect (hook) two sides of the braid thus creating a braided bracelet. Keep sesame seed bowl, molasses bowl and baking sheet next to each other. Holding from the connected side dip simit in molasses water (or just water) from all sides. 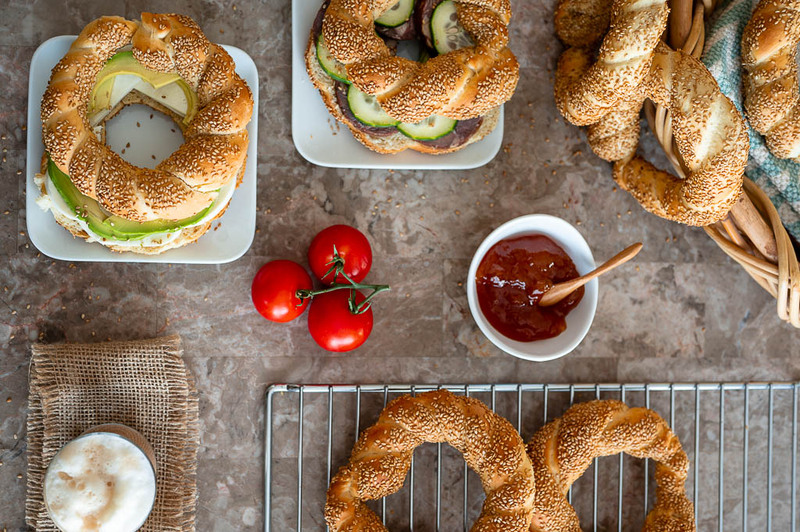 Now take simit to a bowl with sesame seeds and cover all sides of simit with sesame. Place simit on the baking sheet. While you were handling simit it may have shrunk just a little. Don’t worry about it. Once rested a little, you will be able to stretch it a bit to create a larger bagel. Once you are done with all 10 simit, cover the simit with towels and let simit rest for 15 minutes. You do not have to do this. However, as I mentioned above, I like my simit to have a little more puff and volume to it. Simit bakes between 400-450F depending on how hot your oven gets and if the thermostat of it is in tune with the actual heater inside. I set my oven on 400F. Heat it up for 2 minutes and put both sheets of simit into the oven. At this time the oven is not fully warmed up. This gives me perfect opportunity to proof my simit a little longer before they completely bake. Bake simit until you achieve a golden brown color, or maybe a little darker. Time here does not really matter, just because everyone’s oven works a little differently. With simit, your best indicator is color. As always, if you have any questions, I am here for you with any help I can offer. Baking could be very daunting and if I can make your job any easier, I would more than happy. Enjoy your simit and I will see you around. 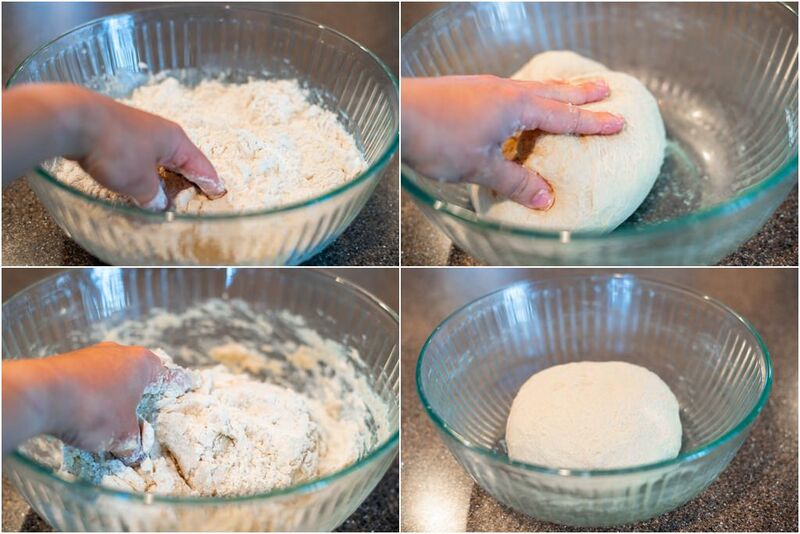 Start incorporating the flour into the wet mixture and slowly create a dough out of everything. If you feel like you need a little more flour to have a dough that doesn’t stick to your hands and is quite soft, add slightly bit more flour. Cut the dough into 10 equal (more or less) parts. You will have 10 simit bagels. Cover the dough pieces with plastic wrap and let them rest for 5 minutes. Meanwhile, place sesame seeds in a wide bowl and mix molasses with water in another. Also, keep 2 baking sheets ready to place braided simit. Place simit on the baking sheet. While you were handling simit it may have shrunk just a little. Don’t worry about it. Once rested a little, you will be able to stretch it a bit to create a larger bagel. Once you are done with all 10 simit, cover the sheets with towels and let simit rest for 15 minutes. You do not have to do this. However, as I mentioned above, I like my simit to have a little more puff and volume to it.